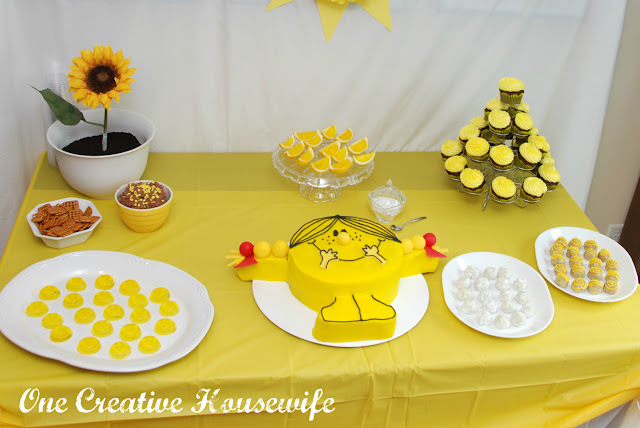 Yesterday I shared the decorations to my daughter's Little Miss Sunshine Party with you. Today I am going to talk about the food we had. For lunch we had burgers, hotdogs, and chicken pull. Our sides were pasta salad, potato salad, ramen noodle salad, veggies & dip, fruit & dip, and chips & dip. That is the boring stuff. Let's move on to what is really important....DESSERTS!!! 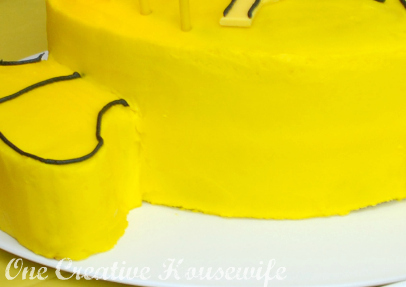 The cake was a white cake with butter cream icing. 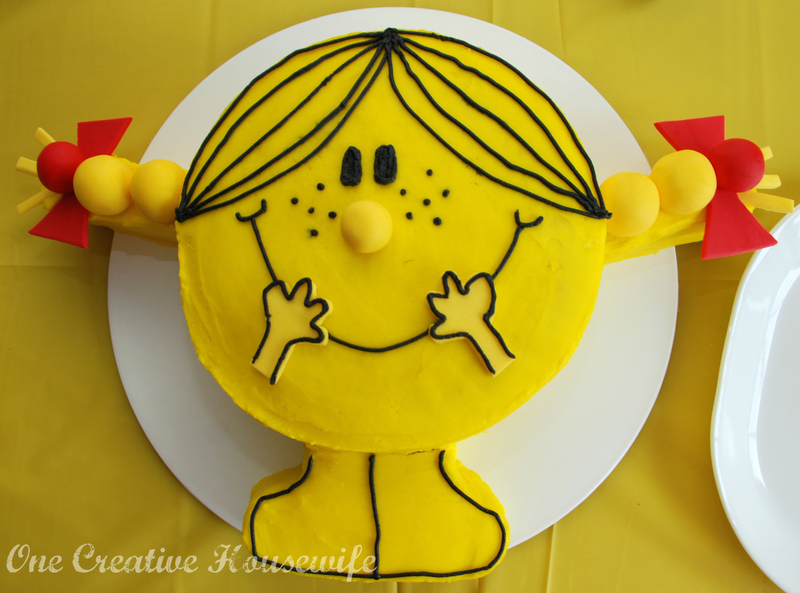 Little Miss Sunshine's hands, nose, and pigtails were made from fondant. The cupcakes were a chocolate cake with butter cream icing. I used an Ateco 829 tip to decorate them. 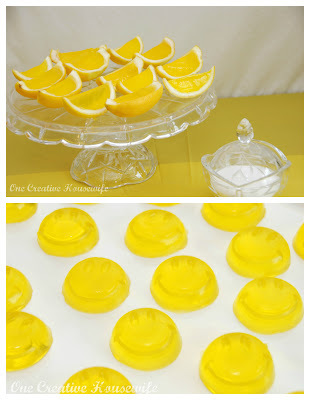 We had alcoholic jello lemon wedges for the adults. They were served with sugar and kept to the back of the table out of the reach of little hands. For the kids we had lemon jello smiley faces (representing Mr. Happy). I made them using a silicone ice cube tray mold that I had found at TJMaxx. We had two different truffles. My favorite were the cake poppers, drizzled with yellow colored white chocolate. 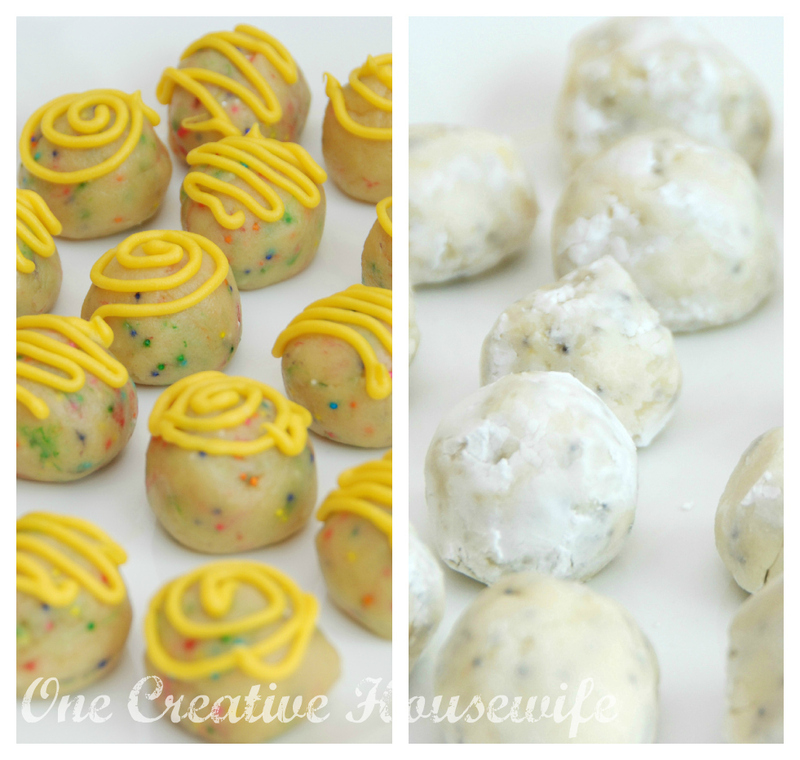 We also had lemon poppy seed truffles rolled in powdered sugar. 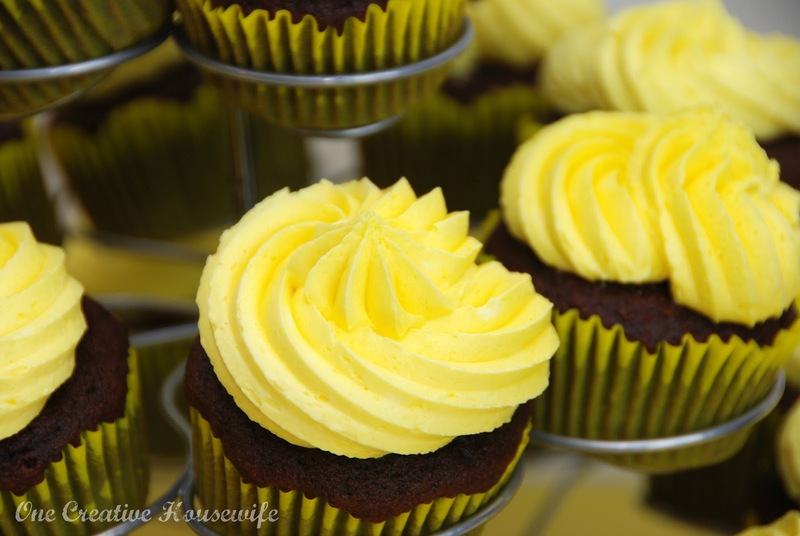 These were a nice contrast to all the sweetness everywhere. 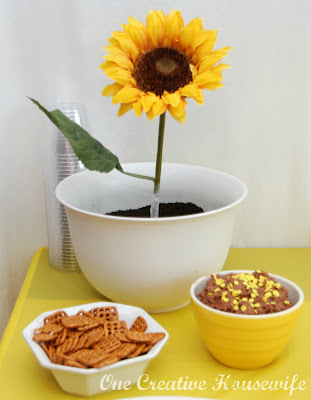 The final and perhaps the favorite desserts at my daughter's party were the dirt (a pudding dessert) and the brownie batter dip served with pretzels. I will be sharing some of the recipes and tips for these desserts with you in future posts, but I want to share this tip with you now. To keep the dish you are displaying your cake on clean while decorating the cake, stick small pieces of wax paper just slightly under the edge of the cake before icing it. 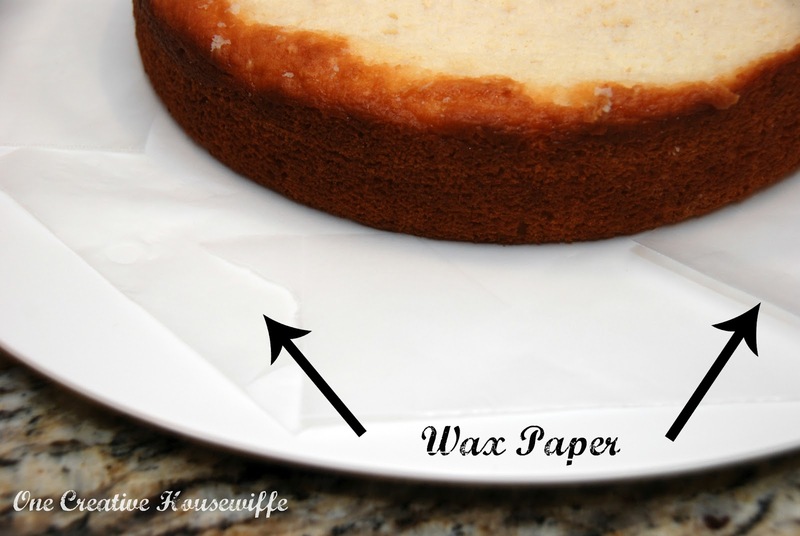 To remove the wax paper, very slowly run your spatula or knife under the edge of the cake (above the wax paper). While you are sliding your knife, slowly pull the wax paper out. You will be left with a clean dish and clean icing edge. What a darling theme! My kids (and husband) love the Little Mrs/Miss books! And the cake is adorable. Great idea! I haven't seen this theme anywhere, but it's too cute! Love the cake and the jellow smiley faces...nice touch! Best Use For A Kitchen Aid Mixer EVER!! !